An interesting an important discussion took place recently at the RSA in Britain - a discussion of what a possible economy in the future might look like, one that supports freedom, equality, and a basic structural change in the system. Watch this event as a RSA Replay. RSA Replay is now a featured playlist on our YouTube channel, it is the full recording of the event including audience Q&A. There will an edited high-res video version of the talk available in a couple of weeks time, and if you subscribe to our channel on YouTube - you'll get automatically notified whenever there's a new video. 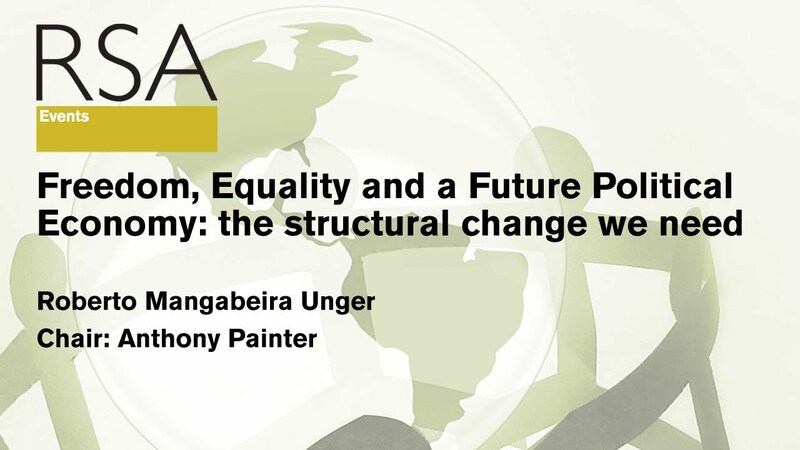 Roberto Mangabeira Unger is an internationally influential social and political theorist and philosopher. A former minister of Strategic Affairs in the Brazilian government, he is a prolific author of works of social theory, legal, political and economic thought, and philosophy, in which he develops a profound theory of self and society. As the Roscoe Pound Professor of Law at Harvard University, he has taught many of the US and world elite, including President Barack Obama. In a special event at the RSA, Roberto Unger asks: where have both the free market right and the social democratic left gone wrong? What are the fundamental economic, political and social institutions we need? And how do we go about making them? Speaker: Roberto Magabeira Unger, philosopher, social and political theorist and Roscoe Pound professor at Harvard Law School. Chair: Anthony Painter, Director of the Independent Review of the Police Federation, and author of Left without a future? Social Justice in Anxious Times. Would an 'Anti-Ketamine' Also Treat Depression?